Love this! Perfect for B&W. I find this pic very peaceful and soothing. Just right for today. i do like it, i discovered threshold quite by accident one day. @chard I've carved rubber stamps for years, and it's a great way to get an good image to transfer as you can make any number of minute adjustments... It's a pretty cool image maker, I think...this one cried out for it in two simple steps! I love this kind of photo. Lovely image, very stark, and I love the silhouettes. 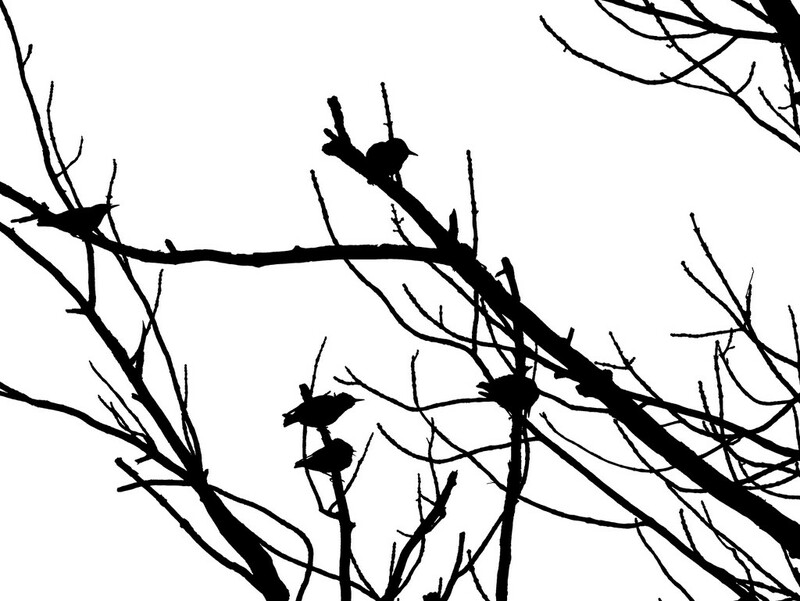 I did something similar a while ago when I saw a whole bunch of birds on the bare branches of this tree, but mine was silhouetted (surprise, surprise!) against a sunset! @panthora When you have the coloration you have, it would be a SIN to go to threshold! (I was supposed to tag someone to do B&W but I just couldn't approach you!) SO...Threshold...do you have Photoshop? Go to "Image"/"Adjustments" and drop down to Threshold. It typically gives you a perfect setting, but you can adjust it. I've been a stamp carver for a number of years, and "Threshold" is a great way to take any image (even a portrait) and get a perfect image for carving. It's makes for some wonderful imagery! @Weezilou Well, darn it, I learn something new here every day!! Thank you for the information, and THANK YOU from the bottom of my heart for not tagging me for the B&W challenge! I had already been tagged on Facebook for it, but I just could not bring myself to do it, and I just let it slide! Maybe some other time or place, but it just seems a sin to remove all that color from my universe, and there are way too many other things on my mind right now! I think it is great that you make rubber stamps, and I can totally see how the Threshold tool would be quite handy with the right picture that lends itself to it. Fabulous use of B&W and silhouettes. It evokes a Chinese sensibility. A fav for me. And BTW, thanks for all the favs you awarded me from the Frontier Culture Museum. It is very affirming to learn that people appreciate your efforts. Louise lovely use of a gray day..................great silhouettes, and perfect b&w! I will try to use threshold sometime. @radiogirl n spite of the starkness, you can get a lot of leverage out of it to suit your needs! Thanks for the kind words and let me know when you give threshold a go! Louise, I do love this idea -- such strong silhouettes, great sharp, high contrast. @Weezilou I wish I could take lessons from you!My husband and I participate in Letterboxing and I like to carve my own stamps.....but they are very....um....rustic.lol. exciting image. nicely done silhouettes!